Recently a sweet friend gave me a parenting book. Thankfully I’m at a good place to receive it…I know I’m in over my head! Single parenting five children is daunting, difficult, and downright exhausting. There was a time when I’d have been appalled that someone thought I might need any professional assistance with my parenting. Not anymore. It’s a good book – well-written, thoughtful, and scripturally based. I’m sure it will inspire me, and hopefully help me become a better mom…I could sure use some inspiration and help. The bigger issue might be finding time to read it. There are, after all, a pile of books beside my bed waiting to be read. 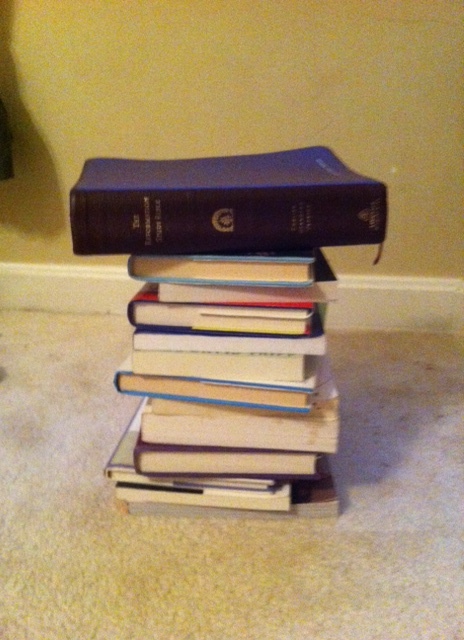 Books on grace, books on prayer, books on everything from A to Z that might possibly help me live this life better. Unfortunately every night I’m completely exhausted and unable to read more than a page without my eyes crossing. The other day as I climbed into bed with my new parenting book, I happened to look over at my bookcase. There, stacked nicely all together, were all my previously read parenting books. I climbed out of bed, walked over and knelt down beside my bookcase. I counted 10 books on parenting. Ten! Apparently I’ve been looking for help for quite a while! Or else someone’s sneaking them onto my bookshelf in hopes that I’ll pick them up and read them and possibly apply what I learn effectively. There was a time when I decided that parenting books were all well and good, but I was determined to simply study the Bible and pray diligently. I don’t think that was necessarily bad. I’m sitting here remembering back to my first two years after my husband left. There was absolutely never time to read a parenting book, any “free” time I had I tried to devote to Bible study and prayer. I knew where my help and comfort was coming from – my help came from the Lord!! Life was stressful. Days were full and overwhelming. My children ranged in ages from toddler to teen. And there was only one parent to figure everything out. I’m remembering how faithful God was to lead me. How gracious He was to guide my parenting, to aid my decision-making, and to refresh me each morning. I had forgotten. I remember how difficult it was, but I tend to forget how precious so much of that time was. My kids and I were closer than ever, our conversations sweeter, our time spent more wisely, our issues less pronounced. I believe that it was because I was praying fervently every night. I was passionate in my approach to staying within God’s will. I have lost that passion recently. I don’t think I’m terribly passionate about anything anymore…just tired. I think I will indeed finish the book my friend gave me, and I will apply any good principles, or at least try to. But I think I most definitely will try to get back to my time with the Lord and my passion for Him more. I think I will not just think about praying, I actually will. I know it isn’t going to be easy…but now that I remember what it was like to do this life with my focus on Christ, I really want that again. It was a blessed time. Maybe someday I can write the parenting book on how to parent without a book. Well, actually how to parent with THE BOOK. Sue, I was a single parent for most of my boys life, then married Tim (a friend of Dan’s) and added his two sons to the brood. Then we adopted two daughters from Ukraine. At one point we had 6 teens in the house at once! I couldn’t agree with you more–THE BOOK is the ultimate book, because it’s from Him that our power comes. And honestly, I think prayer is the most effective parenting tool out there.